The result was not what many Latics fans had hoped for against a Bolton side mired in the relegation zone, low on confidence. But a week ago Latics broke a run of four consecutive defeats with a home draw against Reading. The win against Blackburn in midweek raised our spirits. The draw at Bolton put a halt to a run of seven consecutive defeats away from home. Paul Cook made two changes in his starting line-up, bringing in Josh Windass and Will Grigg for Nick Powell and James Vaughan. He stuck with the 4-4-1-1 formation. The referee, Simon Hooper, set the tone in a potentially explosive derby game by handing out two yellow cards in the first three minutes. Bolton were playing the type of football that one has come to expect of them, with an emphasis on long balls and crosses. Lee Evans spooned a good shooting chance wide of the goal in the opening minutes following an accurate cut back from Windass. But Bolton were ahead soon after when, in the 7th minute, a long cross to the far post reached Will Buckley who evaded Reece James and squeezed the ball into the gap that Christian Walton left between himself and the near post. Wigan’s goal came in the 25th minute with a controversial Grigg penalty after had been felled in the area. Bolton came out in the second half making more of an attempt to play passing football, but their main danger came from crosses. Wigan had opportunities in attack, but their final touch let them down. Bolton had a strong penalty claim turned down in the closing minutes as the ball hit Sam Morsy’s arm. But in the end a draw was a fair result. A couple of months ago Paul Cook was the toast of the town, as Latics were heading towards the playoff zone of the Championship. But now some of those fans are already talking about him being sacked. 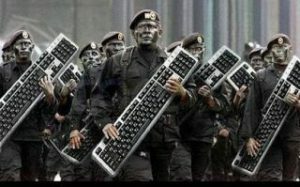 “Football managers are judged on results” is an old adage, but the keyboard warriors are already rearing their heads through the social media and message boards, despite an upturn in results leaving Latics unbeaten over three games for the first time in the Championship since 2014. The Reading game was disappointing, but to follow it with two local derbies in the space of three days was always going to be a tough test. To come away with four points from those two games was something that one might not have predicted a week ago. Latics are currently in 15th place after 20 games played. In both 2014-15 and 2016-17 they were second from bottom at the same stage, eventually finishing in the same position at the end of each season. 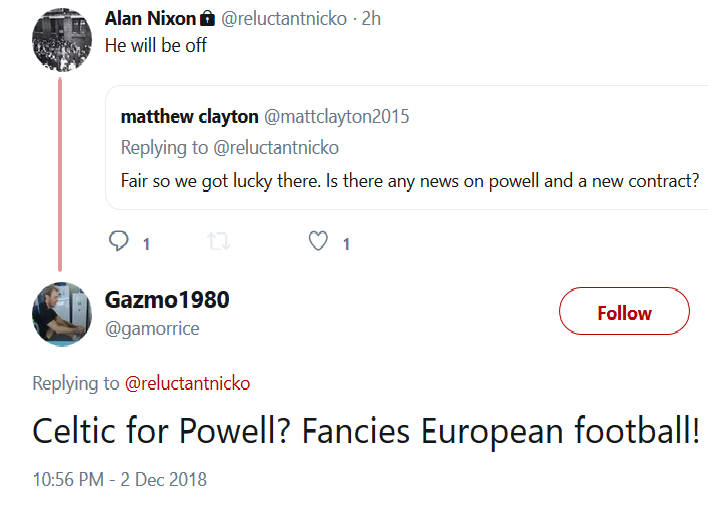 In both of those relegation seasons Latics had sacked their previously successful managers, Uwe Rosler and Gary Caldwell, after a run of poor results, replacing them with the inept Malky Mackay and Warren Joyce. It is to be hoped that the new IEG ownership will use better judgement than the Whelan family did in those instances. Cook is building a young team to provide a backbone for the future. At times many of us have been disappointed with overuse of the long ball, but the positives outweigh the negatives and it is the time to support the manager rather than make blanket attacks on him in the social media. Latics found it hard to play fluent football, given the physicality of the opposition. But on too many occasions when they managed to get in wide behind the Bolton defence the final cross was way off target. Nathan Byrne was particularly guilty in this respect. Against Blackburn we saw some high-quality crossing, two gems from Kal Naismith particularly coming to mind. Naismith might not be the epitome of a flying winger, but his crossing from the left is reminiscent of that of Jean Beausejour. But Bolton had certainly done their homework, giving neither Naismith, nor his partner on the left, Gary Roberts, little space in which to deliver crosses. 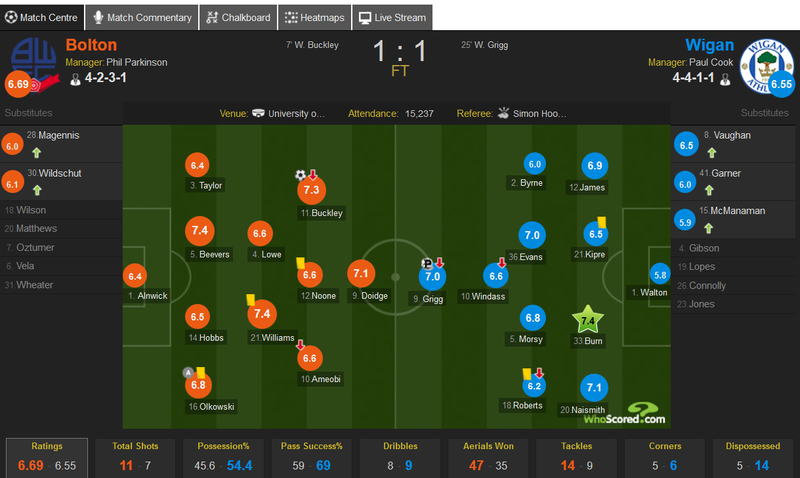 The stats on the match from the Wigan Athletic site reveal that Bolton put in 26 crosses and Latics 25. But the crossing accuracy stats show 20% for Bolton and a meagre 4% for Latics. Over the summer the rumours were flying around that Latics were going to sign one of their old favourite wingers. Fans debated the merits of Callum McManaman and Yanic Wildschut. The eventual loan move of Wildschut to Bolton was a surprise, given the kind of salary he was receiving at Norwich and Bolton’s precarious financial situation. He scored an 89th minute winner for the Trotters at West Bromwich on the opening day of the season, then the winning goal in a 1-0 defeat of Reading a couple of weeks later. But Wildschut has only started in four league games, with 11 appearances off the bench. He came on after 77 minutes yesterday, but apart from one good cross, made little impression. McManaman also came on as a substitute yesterday after 68 minutes but had little impact. He has made one league start this season, with 12 appearances off the bench, scoring one goal. The season is nearing its half way point. Will Wildschut and McManaman be able to claim regular places in the starting line-ups before the season ends? Do controversial refereeing decisions even themselves out over the course of the season? Cook’s comment that Joe Williams could have had a red card in the second minute brings to mind the Blackburn encounter when James Vaughan’s tackle on Jack Rodwell early in the game left the player in distress. Vaughan went on to have his best game for Latics. If he had received a red card for his dubious challenge, would Latics have won the game? In the same vein, would a struggling Bolton team have survived if Williams had been given his marching orders? Latics were going to play the 12 men when visiting Old Trafford. The Championship is a different kettle of fish. A loss for the likes of Manchester City and Liverpool makes the headlines in the Premier League, but in the Championship, it is rarely a surprise for a team near the bottom to beat a team at the top. Moreover, with 46 games to play, compared with 38 in the first tier, the Championship is physically more demanding over the course of a season. So many games in the Championship are finely poised and it can take just one adverse refereeing decision to tip the balance. But the division itself is by no means homogeneous, with the larger clubs, with bigger fan bases, tending to occupy the higher positions. Aston Villa and Leeds average over 30,000, Brentford and Rotherham less than 10,000. The effect of a large, partisan crowd on refereeing decisions cannot be discounted. Apart from yesterday’s game, the “margins” have not been favourable for Latics away from home. Those little bits of “luck” have rarely gone their way. But with two penalties in their favour in the last two games is the tide turning? More changes coming in January? 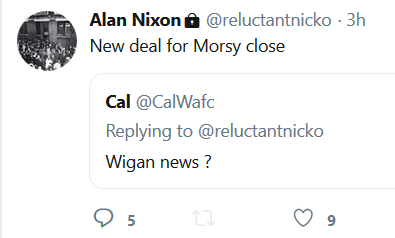 Alan Nixon has once again been busy with Latics news on Twitter. Given the impending departure of Dan Burn in January and the lack of cover for Antonee Robinson at left back, much of what Nixon is saying makes sense. But is Cook really looking for another striker when he already has Will Grigg, Joe Garner, James Vaughan and Josh Windass? Is one or more of them likely to be leaving?